Posted 01-24-2013 by Dale Bohman. The Monsoon Outdoor Banner Frame! The Monsoon Outdoor Banner Frame is a great way to display your event banner! You’ve got an event coming up, you want to highlight it but you’re not sure where you can hang your banner, well we now have a great solution for you. This sturdy aluminum frame gives you the following features! Wrinkle Free Display of Your Banner! Easy to re-use with different banners. This solution is great for indoors or outdoors, it’s 2-sided design makes it great for sporting events. Stand it up on end for a vertical display banner! Put a couple of these around a court for sponsors and they will love it. This banner was created by St. 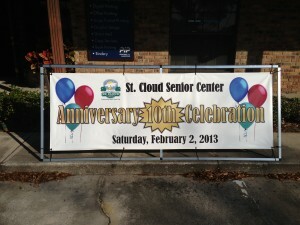 Cloud Parks & Recreation to promote the 10-year anniversary of their senior center. They wanted a way to display a banner outside their building so that people could see it as they drove by, but there was really nothing to mount it on…enter PIP Signworks. We had the perfect solution! Check out our photostream HERE on Flickr to see more of our unique solutions!